NOW is the time to add compost, manure, cottonseed meal, etc. 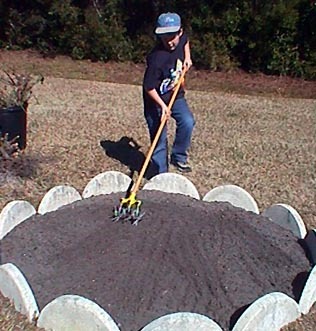 Work it into the top 3 or 4 inches of soil. 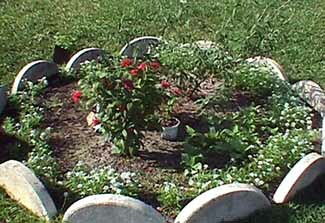 I am planting my new nectar garden in a previous rose bed. This is very fertile soil, but I added mushroom compost, a little cottonseed meal and some Superphosphate, then worked it in. Cottonseed meal will add nitrogen to the soil, acidify it, and attract worms. It's great for azaleas and other acid loving plants. 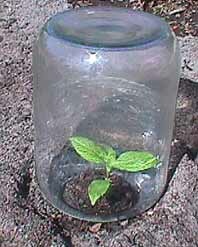 Superphosphate will help the plants grow strong branches and help flowering. By adding slow release nutrients now, I won't have to fertilize this summer at all. 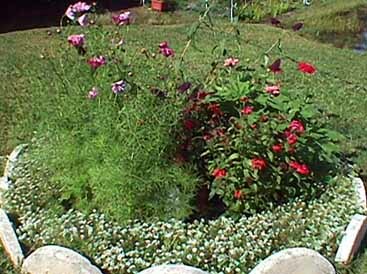 I prefer using organic fertilizers instead of chemicals. Plan your garden on paper first. Graph paper works great. Measure your garden, then use one block of the graph paper to represent one inch. 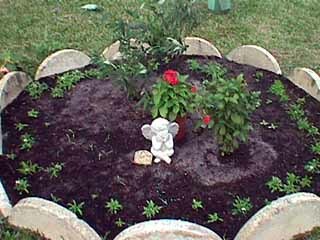 Plan your placement of plants according to mature size. 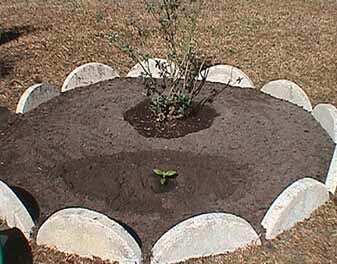 I plan to use one Butterfly Bush (transplanted from another area in the yard) and one red Penta (a rooted cutting from last year's plant) as the 'anchors' of my garden. 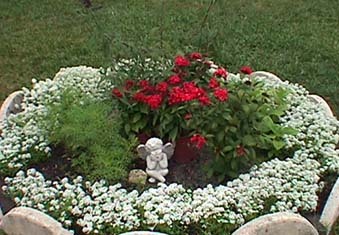 I will encircle them with white alyssum. Any leftover spaces will be filled in with Cosmos and Zinnias. I know that Butterfly Bushes will grow to about 5 feet wide here. I planted mine two and a half foot from the edging stone. 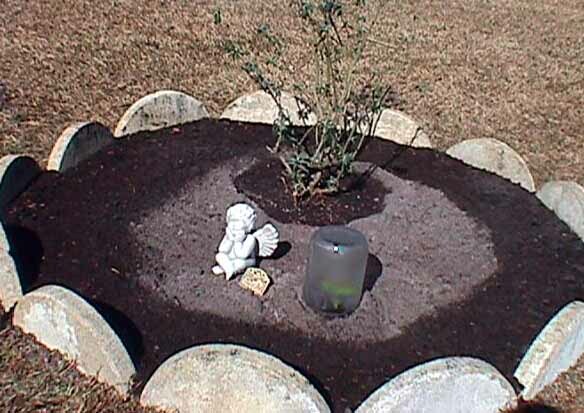 The Penta will grow about 3 feet wide, so I planted it on the opposite side of the circle from the Butterfly Bush, one and a half foot from the stone. 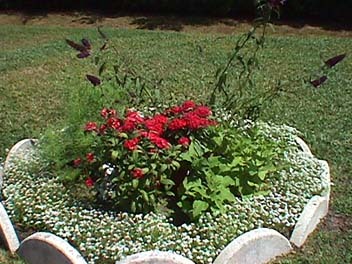 I marked a row 12 inches all around the bed from the stone, and scattered Alyssum seed. Planting the proper time is important too. In Florida, January is the time to plant Alyssum seed (I'm a month behind). My butterfly bush has already started putting on new growth, so I hope I transplanted it at the right time. It's a little too early for Pentas, they can't take frost, so I know I'll have to protect it for the next month and a half. It's small enough that it won't be hard to do that. 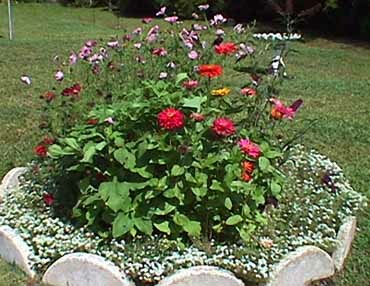 I'll wait till mid March or early April to plant Zinnia and Cosmo seeds. These need to be direct sown, rather than started early in pots. Before putting any plant in the ground, I always use root stimulator. I mix with water, according to directions, in a plastic tub, then set the root ball in the tub of water long enough for the plant to soak up some of the water. After planting the plant, I water it in, using the root stimulator mixture. I plan to update this page as the garden progresses. We can watch it grow together. It will be fun to see monthly photos from the start of the season and follow it till frost hits. Please check back to see how we're doing. It's now the first week of March. I planted Zennia, Tithonia, and Cosmo seeds in the rest of the bed. I mixed seashell cosmos with orange cosmos for lots of color. I've got the 'spider' Zennias, and some Orange Mexican Sunflowers (Tithonia). The best thing about all of these seeds is that I got them from cyber friends in seed swaps. If you're one who swapped these seeds with me, thank you!!! Late March, the Alyssum started blooming. On April first, it is in high gear. 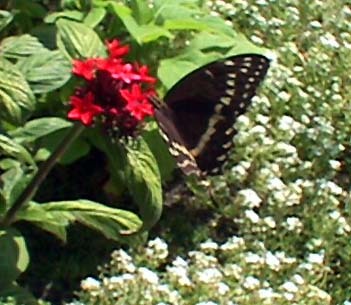 The penta has several good flower heads on it, and the butterfly bush is showing its first buds, although they are still green. The Zennias, Mexican Sunflowers, and Cosmos are getting taller, but no flower buds yet. Everything is looking healthy. I've turned on the sprinkler system now, and they are getting a good watering every other day. The days are warm, with daytime temps in the 70's, nights down to the 50's. April is the 'rainy month,' so this garden should really take off this month. April is almost gone, and the garden is in high gear. I've watched the Palmedes Swallowtails and hummingbirds going nuts. Even the love bugs are attracted to the alyssum. Don't ask me what a love bug is, cos I have no idea LOL. The Cosmos all have flower buds, almost ready to open. Zennias have buds too, but they are still tightly closed. 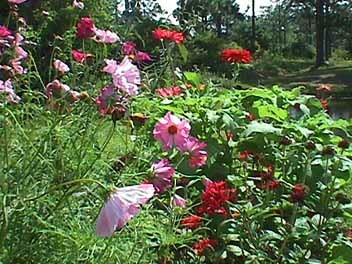 Early in May the Cosmos and Zennias opened. The Alyssum needs to be sheared, as the flowers are almost done. The butterfly bush has wonderful blooms. As you walk near, you can smell the honey-sweet scent of the butterfly bush and alyssum. The garden has filled in very nicely, butterflies and hummers have indeed discovered it! Got questions? Post em on my forum!